Conjugated Linoleic Acid (CLA), is a naturally occurring free fatty acid found mainly in dairy products and meat. For vegans and vegetarians getting enough CLA from diet alone may not be possible, in fact even for people who consume meat and dairy getting enough CLA from diet alone for certain health benefits would require considerable intake of these types of foods. This is very impractical, and may also have a seriously negative effect on one's metabolism due to the high saturated fat and calorie content of meat and dairy . DEVA Vegan CLA is produced from linoleic acid in safflower oil. 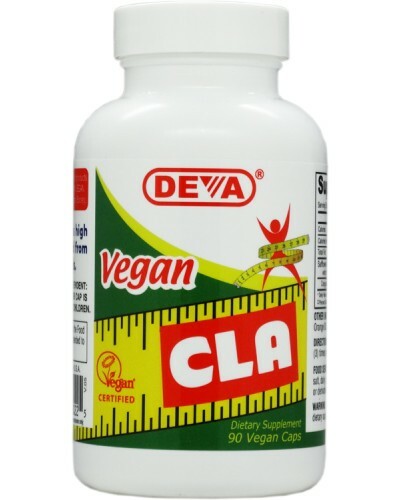 DEVA Vegan CLA is 100% animal free, and guaranteed for purity, freshness and labeled potency. Remember all DEVA Products are 100% vegan, vegetarian and are registered by the Vegan Society, the non-profit organization that actually invented the word "vegan". For adults take one (1) vegan capsule three (3) times per day with meals or as directed by a doctor. Free of yeast, wheat, gluten, soy, sugar, salt, dairy, egg; animal products, byproducts or derivatives. * "Int J Obes Relat Metab Disord. 2001 Aug;25(8):1129-35. Risérus U, Berglund L, Vessby B. * Gaullier JM, Halse J, Høye K et al. J Nutr. 2005; 135:778-84. * Zambell KL, Keim NL, Van Loan MD et al. Lipids. 2000; 35:777-82.